The highly anticipated sequel to the #1 free education app in over 50 countries has arrived! Kids will master 1000 essential English words through hours of fun, engaging activities. Your child will improve listening, reading, speaking and spelling skills as he/she advances through twenty challenging vocabulary levels. Designed by education experts, and approved by kids, parents and teachers, this app is a great extension to EF’s Efekta™ system for learning in class or at home. EF has helped millions of people worldwide learn a language since 1965. To learn more about EF, the world’s largest private language institute, visit www.ef.com. 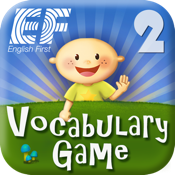 Download the free EF High Flyers Vocabulary Game 2 now to improve your child’s English and confidence!